There are a few key differences when it comes to flu vs. cold. Here, doctors compare flu symptoms with cold symptoms, and tell you when you need to go to the doctor for flu treatment. When you feel miserable, all you care about is getting better. But in order to stop your sniffles, you need to know what's making you want to use your comforter to turn yourself into a burrito. And during cold and flu season, it can be tricky to know for sure if you have influenza or a cold since so many of their symptoms overlap. Learn the symptoms of both cold and flu, as well as how to distinguish which one you're dealing with so you can seek the treatment that will actually make you feel better. 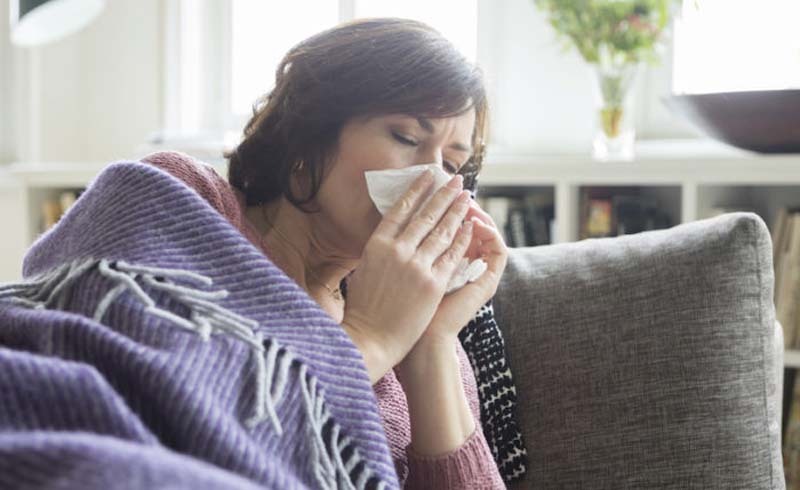 Part of the reason it can be tricky to know whether you have the flu or a cold is simply because there are only a few minor differences in their symptoms. A runny, stuffy nose, sore throat, cough, sneezing, and body aches are common with both; with the flu, you can expect to also develop a fever, weakness, fatigue, chills, and a headache. So do I have the flu or a cold? The biggest differences between the symptoms of influenza and a cold are their severity and how quickly they develop. Flu symptoms also occur abruptly. “One day you are feeling OK, and the next, all your symptoms arise,” says Michael P. Angarone, DO, professor of infectious diseases at Northwestern Memorial Hospital. Compared to the flu, a cold is milder and symptoms gradually set in. “If you don't feel horrible, you probably don't have flu,” Dr. Ladapo says. If you aren't sure which you have and how to treat it, talk to your healthcare provider over the phone or make an appointment to see them in person, Dr. Angarone recommends.